Evacuation Chairs are an ergonomic and secure seat that’s designed to remove someone with insufficient ability to move freely and easily, from a place of danger to a safer location. Therefore, providing an equal means of escape for all. There are many reasons as to why a person may require assistance during an emergency situation, or simply to getting around a building on a daily basis. Some examples could be a physical disability, an injury, mental health issues, heavy stages of pregnancy or other medical conditions. An evacuation chair provides the perfect solution for most situations. 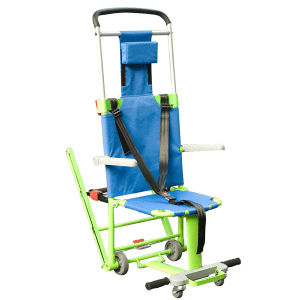 The Evacuation Chair models below can be found in some very prestigious buildings all over the world such as the Burj Khalifa skyscraper, along with the Rose Rayhaan Hotel in Dubai as well as Emirates Airlines. We supply the NHS, Travelodge, Sainsbury’s and many more businesses throughout the UK and abroad. UK evacuation chair law, what is required? To read more about current legislation and your responsibility to provide a safe exit for all, including the provision of Evacuation Chairs, see The Regulatory Reform (Fire Safety) Order 2005. What other options are available in addition to Evacuation Chairs? 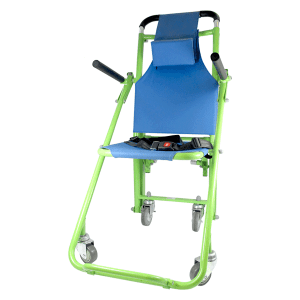 In addition to Evacuation Chairs, our Patient Transport Chairs are used in many hospitals and care homes on a daily basis to transport patients safely and comfortably or as an option for ascending stairs from lower levels. Other types of chair, equipment and services are available on our homepage. The price displayed online for every Evacuation Chair has been automatically discounted for you in order to reflect a special 5 percent saving for all online orders. Below is our current range of evacuation chairs, please click the images to get more information on each model. These are the best prices available as of 20th April 2019.